Takes just 15 minutes to throw this delicious lunch together. In a small fry pan or saucepan, toast your pine nuts until golden. Remove and set aside. in the same pan, heat your butter and olive oil until all the butter has melted. Drop in your sage leaves into the hot oil mixture, toast it quickly but don’t allow it to burn. Turn off the heat immediately and keep tossing the leaves in oil for a few more seconds. Use a slotted spoon to remove the fried leaves and allow them to sit on kitchen paper to absorb any excess oil (do not throw your butter/oil mixture away!). Cook your pasta according to the instructions. Drain and toss into your still warm oil. Pour over your lemon juice and add your toasted pine nuts. Toss well to mix thoroughly and season to taste with salt/pepper. To serve, scatter the fried sage leaves on top. 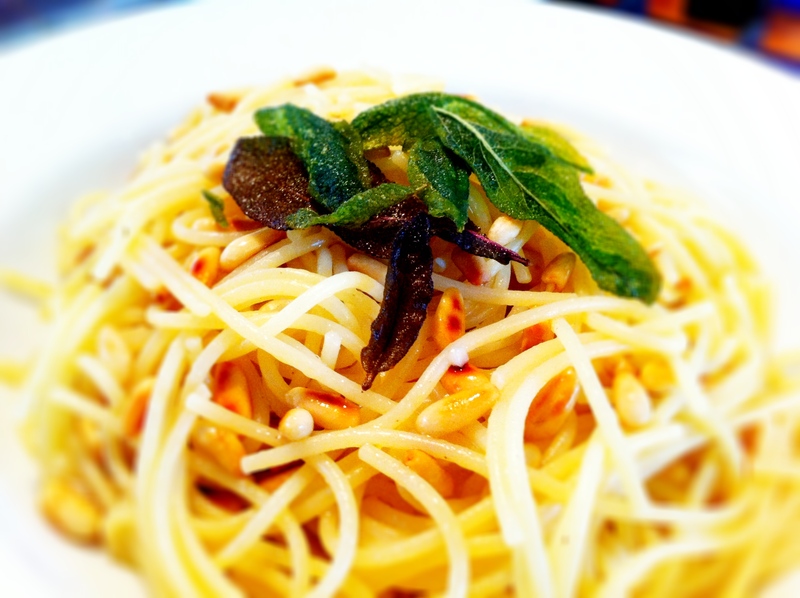 Garnish with lost of grated parmesan.